Prohibition ended in 1933. 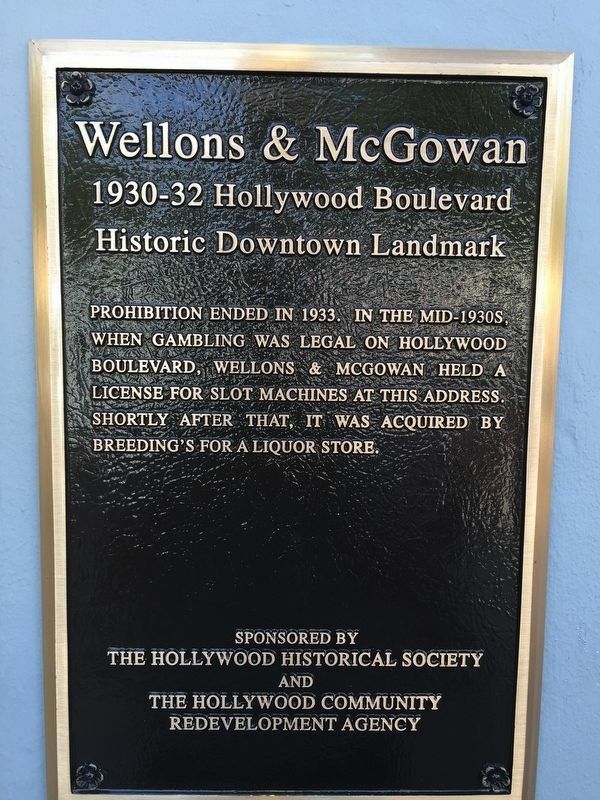 In the mid-1930s, when gambling was legal on Hollywood Boulevard, Wellons & McGowan held a license for slot machines at this address. Shortly after that, it was acquired by Breeding's for a liquor store. Erected by The Hollywood Historical Society and The Hollywood Community Redevelopment Agency. Location. 26° 0.678′ N, 80° 8.775′ W. Marker is in Hollywood, Florida, in Broward County. Marker is on Hollywood Boulevard (State Road 820) east of South 20th Avenue, on the right when traveling east. Touch for map. 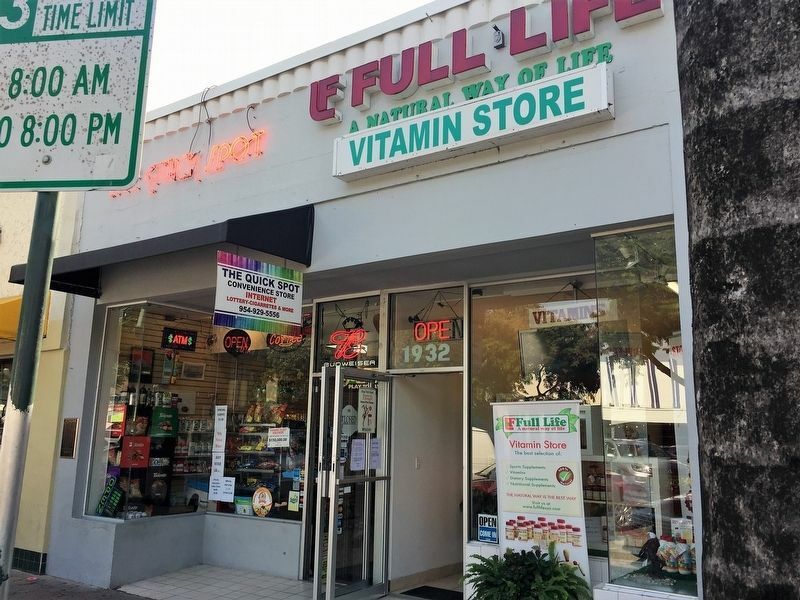 Marker is at or near this postal address: 1930-32 Hollywood Boulevard, Hollywood FL 33020, United States of America. Touch for directions. 400 feet away, measured in a direct line); Hammerstein House (approx. half a mile away); Ebenezer Missionary Baptist Church (approx. 1.2 miles away); Greater Ward Chapel (approx. 1.3 miles away). Touch for a list and map of all markers in Hollywood. More. Search the internet for Wellons & McGowan. Credits. This page was last revised on November 20, 2016. This page originally submitted on November 20, 2016, by Jay Kravetz of West Palm Beach, Florida. This page has been viewed 141 times since then and 7 times this year. Photos: 1, 2. submitted on November 20, 2016, by Jay Kravetz of West Palm Beach, Florida. • Bernard Fisher was the editor who published this page.